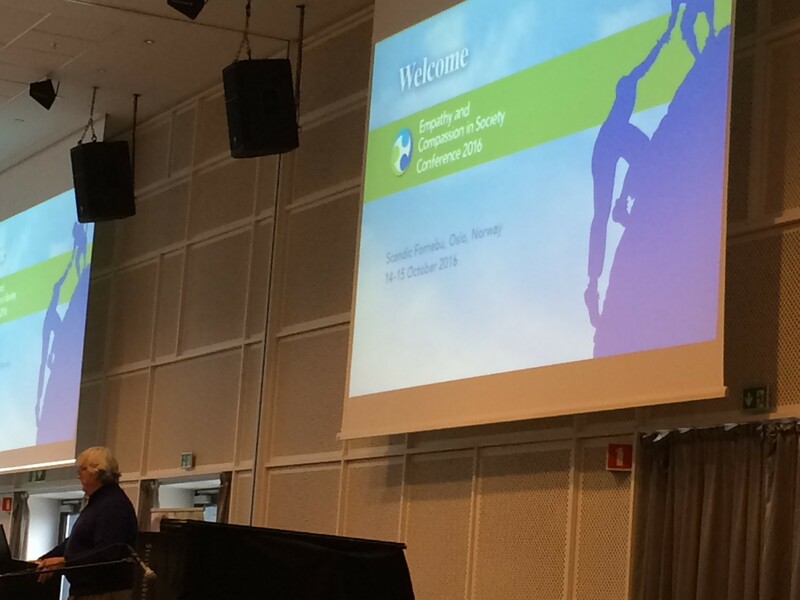 Jan from Wake Up Nijmegen shares about his experiences and insights from attending the Empathy and Compassion Conference in Society conference in Oslo, Norway, in October 2016. I have attended many kinds of international conferences. However, this one about empathy and compassion was distinctively different than the ones I’ve been to before. This international conference in Oslo, Norway, was a place where my secular, public role as a healthcare professional met with my personal self as a meditation practitioner. It was quite an exciting experience because quite often, these two parts of me feel like worlds apart from each other. Ironically, as it turned out in this event, scientific research consistently points out that these two selves are not so far apart from each other. Practicing mindfulness and compassion have a significant positive effect on our mental, emotional, and even physical health and well-being. Thanks to the extensive research of scientists like Ellen J. Langer, Jon Kabat-Zinn, Paul Gilbert and Richard Davidson, our academic and healthcare communities are starting to embrace contemplative practices such as meditation. In short, the practice of accepting the here and the now is finally becoming “accepted” by modern, evidence-based healthcare. Besides the pretty straightforward research results on the positive effects of meditation on the brain that were presented during these two days in Oslo, there was another message that I thought was particularly exciting to bring home with me from the Norwegian capital. This idea was not so much based on science, but therefore by no means less interesting. To be successful in our ambitions to move ourselves and the world forward, we have to continue the practice of introspection (meditation). She pointed out that as an advisor to dozens of development projects, she has seen many excellent social and health initiatives fall apart because the people involved failed to continue to pay attention to how certain events or situations were interrelated with their own inner world. The neglect of introspection bears the risk of exporting an inner conflict – within ourselves – into the outer world or vice versa. We can fail to see that our anger, fear, or passion are emotions that find their origins within ourselves. In this way we cannot prevent ourselves from projecting those strong emotions on the people or world around us right away. Our frustrations can be prompted by the outer world, but they happen within us. Our passion can be elicited by the other, but yet that feeling is within us. Not seeing this nuance can result in blame, resentment, or hate for others (and for ourselves as well). Obviously we will be confronted with events, people, or situations that are understandably provoking intense emotions. Practicing mindfulness can help us to be more aware of this interdependence between emotion, our experience, and a situation. Therefore, training introspection is providing us with more freedom and insight to respond to a specific situation, person, or an emotion in a more effective way. In our highly interdependent world, society and daily life, having a deeper insight into these things can be pretty beneficial, if not essential. This sharing was also published on www.wkup.org, alongside a sharing by Susanne from Wake Up Oslo who also attended the conference.